The genesis for our Annual Selkirk Settlers’ Commemorative Celebrations in Winnipeg, Manitoba, emanated from the intent and commitment by the St. Andrew’s Society of Winnipeg, (founded 1871), to ensure that the Bicentennial for the arrival of the Selkirk Settlers in Winnipeg and the Province of Manitoba, was to be recognised in a significant and appropriate fashion. Subsequently, in the spring of 2005, the Society seconded Communications Chair, Mr. John Perrin III, to approach a fellow member of the Society, Mr. Rob R. Bruce-Barron, to enquire as to his interest in undertaking such an initiative. 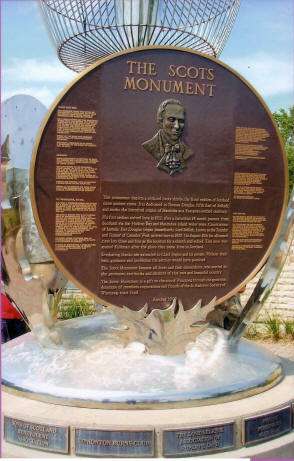 Upon reviewing the potential, Rob came back to John and the Society with the suggestion, that what was needed was a sustainable precursor to the 2012 Bicentennial that would serve to steadily heighten the visibility of Scottish Heritage and Culture and commensurately identify multiple contributions to Manitoba’s rich history. Rob was surprised to find that there was little or nothing in the form of a continuous inclusive event recognising and celebrating the arrival of the Selkirk Settlers in Winnipeg. His recommendation therefore, was that an annual event be evolved and conducted as a yearly precursor to 2012 Bicentennial celebrations. Consequently, Rob designed the first event, with invaluable orientation in-put from John Perrin III, and the inaugural Selkirk Settlers’ Commemorative Celebration was conducted on September 10, 2005. In year two, 2006, a Selkirk Settlers’ Core Committee was formed under the chairmanship of Rob Bruce-Barron, and this committee is the nub of the Committee which will ultimately be responsible for designing and delivering the 2012 Bicentennial event, and will selectively added to each year. Our annual commemorative celebrations, are designed to be inclusive of all Scots associations, organizations and interest groups, as well as First Nations who played such an integral role in the survival of the first Selkirk Settlers, French Canadian Voyageurs from Fort “Gibraltar”, the Metis, and in the near future the North West Company and the Hudson Bay Company (HBC). Each year the City of Winnipeg enables us to congregate in the Winnipeg City Hall Plaza before setting off in the late morning, proudly led down Portage Avenue by the St. Andrew’s Society of Winnipeg Pipe Band. Members of the public, members of the St. Andrew’s Society of Winnipeg, related organizations & public officials all march in appropriate regalia, to the skirl of the pipes and beat of the drums along picturesque Waterfront Drive to the landmark and unique Scots Monument, be-quested to the City of Winnipeg by the St. Andrew’s Society of Winnipeg, situated at the historic Selkirk Settlers’ disembarking location on the grassy banks of the Red River. There various invited dignitaries bring greetings from their particular agencies and each year we are then privileged to be provided with a keynote address from different, invited, high calibre presenters each year. In our first two celebrations our notable presenters have been Professor J. M. Bumsted and Professor St. John, 9th Earl of Orkney. This year’s keynote address will be delivered by Mr. Bill Blaikie, M.P. We endeavour to conduct this event as near to the original time-line for the arrival of the Selkirk Settlers as possible. 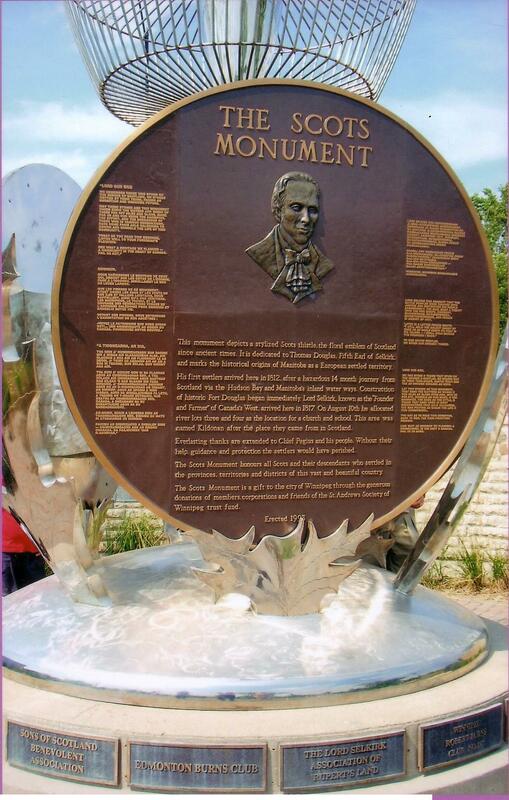 The first landing in Winnipeg was on August 30, 1812. In deference to the long weekend held on the last weekend in August each year, we hold our celebration on the first Saturday following. significant first for the Annual Selkirk Settlers’ Commemorative Celebration; most notably, a vibrant ceremony acknowledging the newly erected `Clearances Monument’. Official dedication will take place in 2008. Winnipeg President Bob Darling addressing the inaugural attendees.